A "normal" journalist working at a local TV station or newspaper is faced with dozens of ethical questions a day. The intensity of these questions vary, but nonetheless, every journalist is faced with some type of ethical question on a daily basis. Some experienced journalists may not even realize this after having been in the field for so long. But one place where journalism ethics are having to be constantly reviewed, is at war. Journalists who are attached to military troops essentially become part of them. However, the two sides have some very different missions. Not to say they don't share similar goals when it comes to the United States, but war is viewed through a different lens by a journalist and a soldier. Embedded journalists are faced with trying ethical questions every second, with every word they report while witnessing war zones. How does one prepare a standard code of ethics for an environment so intense and full of surprises? There's really no one specific way. However, having a good background in ethics is vital, and can determine the outcome in an embedded journalist's career, or even life. 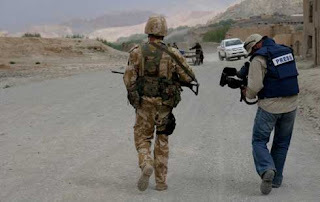 Embedded journalists are essentially part of the troop while they're reporting combat. Although this is necessary in order to report the truth, it can easily initiate ethical dilemmas. It's up to the journalist to decide how to handle it and also to internally discuss how his or her decision will affect the story being reported. AP reporter Christopher Torchia stood behind his decision to carry an injured soldier's ammunition belt. "I thought: I am living, eating and breathing with these guys. They need a little help here," Editors Weblog reported. How dangerous is too dangerous? Another question that has many different answers when it comes to embedded journalism, and a personal question that embedded journalists are constantly faced with. An article published on American Journalism Review discusses the "relentless violence" of the Iraq War and how it has limited journalist's ability to safely report on it. It also offers the criticism that embedding journalists not only threatens their safety, but can skew the reporting "under the scrutiny of the military." There have also been criticisms that there haven't been enough embedded journalists to fully capture the intensity of America at war. This has resulted in some monumental controversies including the leaking of military documents by Chelsea Manning. This New York Times article written by Manning reveals the reasoning behind his illegal actions with further criticisms of embedded journalism. There will always be that fuzzy line between right and wrong in high intensity environments like the battlefield. However, even if a you're not a war correspondent, it's important for journalists to have a strong code of personal ethics to stand behind. You never know when you might have to make a life-impacting decision as a journalist, whether it's at war or at the local newspaper.